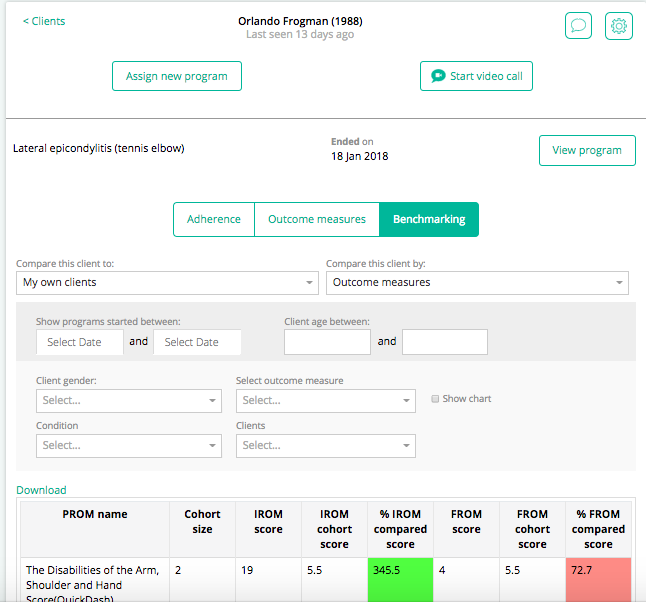 Our Benchmarking feature lets practitioners compare the reported outcomes of a client to groups of other clients: either their own clients, or clients from the healthcare practitioner's clinical group. The comparison is done with a simple methodology that is meant to be easy for the client to understand. This way the client gets a connection between the data they report in PhysiApp as part of the patient journey. If Benchmarking has been activated inside a practitioner's account, and a client has input data (outcome measure answers and / or exercise adherence), the Benchmarking tab is visible in the client details page. To benchmark a client to other clients, select Compare this client from the dropdown menu. Output data will be the score of your patient benchmarked against the average of the cohort, as selected with the filters. 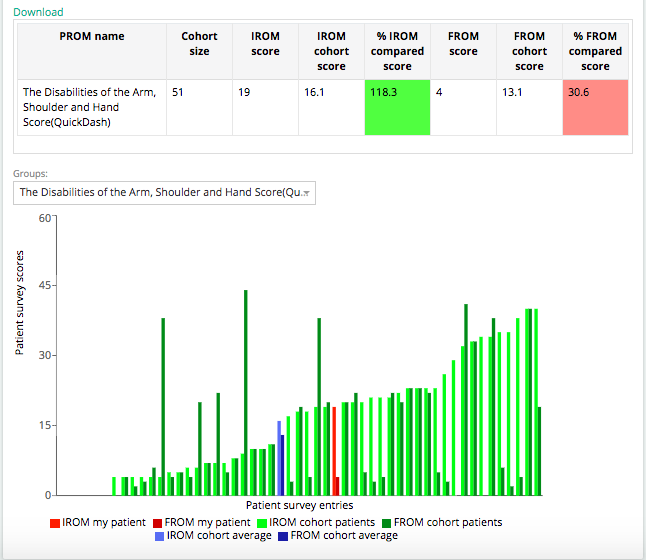 If a patient only provided one outcome measure score, then IROM = FROM. When Show Chart is selected, a graphic display of the patient outcomes compared to other patients in the defined cohort is displayed. Your patient will be marked in Red, the average of the cohort is marked in Blue and all other patients are marked in Green. This is a great tool to show your patient where he/she ranks in the cohort and it can be a great hands-on motivator for getting a patient to get better faster in order to "catch up" with the cohort.